Size : King h 2,9″ and Base h 0,9″. Material solid cast metal, brass and nichel finished. 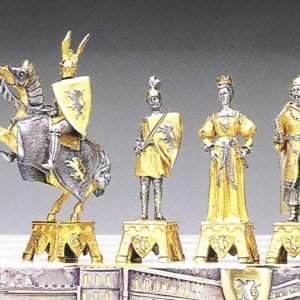 The chess pieces are totally hand painted and Made in Italy by Italfama. Can you immagine chessmen better then ours? The famous Roman-Barbarian battle in 451 A.D. In that year the Roma’s Empire Army led by Great General Flavius Ezio defeats the enemy Attila the leader of the Huns, in the memorable battle of Chalons-sur Marne, battle considered one of the most important in world history. In 452, Attila, descends to Italy, plundered the Po valley, his intention was to occupy the empire capita, the beautiful and rich Rome where at least one million people leave. But Pope Leo I goes to Attila and persuades him to retire beyond the Danube river. Attila was a strong warrior and he did not want really to stops, his nicknamed “Scourge of God”, so passes the Alps again the following year, in 453 A.D., but he died suddenly during the festive banquet for his marriage to Hilda. 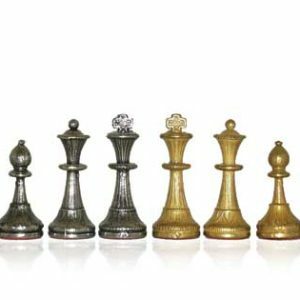 The Roman-Barbarian chessmen will give you the pleasure to play with beautiful chessmen, remember the ancient history and fell like a great army leader.